It is with great sadness that the family of Lottie Leibel announces her peaceful passing, at the age of 89, on November 3, 2018 in Kelowna after a long and courageous battle with ALS. She leaves to cherish her memory, children Brian (Wendy) Leibel of Calgary and Debra (Wayne) Schiissler of Kelowna, five grandchildren Christina (Ben) Druce, Douglas (Amanda) Leibel, Marcia Williams, Derek Schiissler and Dustin Schiissler, seven great-grandchildren and numerous nieces and nephews. Lottie was predeceased by her parents Christian and Wilhelmina Ruopp, her beloved husband Herbert (1993) of 44 years, son Jimmy (1970), her sister Margaret Brodt and her brother Hans Ruopp. Lottie was born in Regina on January 30, 1929 and lived in Zehner, Regina and her later years in Kelowna. She was a devoted and loving wife, mother and grandmother. She will be greatly missed by her family and friends. A funeral service will be held on Monday, November 12, 2018 at 2:00 pm at Regina Funeral Home, 4001 East Victoria Avenue, Regina, SK with Pastor Ted Giese officiating. Interment to follow at Riverside Cemetery. A memorial service will be held at the Village at Mill Creek in Kelowna, BC at a later date. 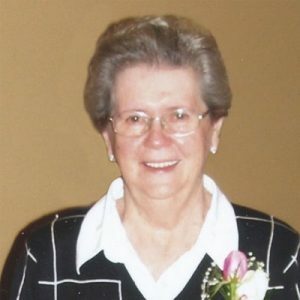 The service for LEIBEL, Lottie is scheduled for Monday, November 12, 2018 at 2:00 pm . Below you will find the map for the service location and the contact information should you have any questions. I got to know Lottie through my sister in law Bunny Wood she played Bingo & crib with Lottie for many years at Village of Mill Creek. Lottie always had a smile for everyone. Bun & I will miss her. Deepest Sympathy to all her family. RIP Lottie. Bunny Wood & Gerry Malish. Sorry to hear about the loss of your dear mother our deepest condolences prayers and thoughts are with you during these difficult time.